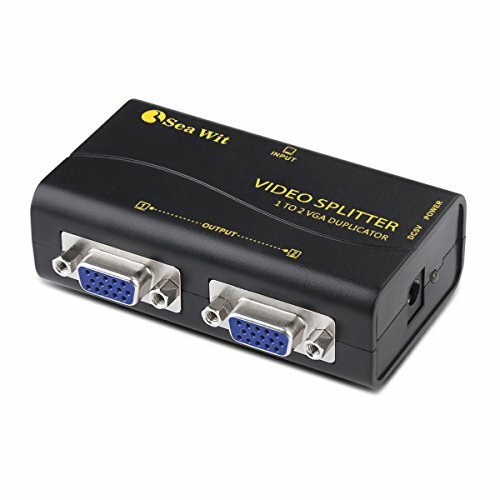 This VGA splitter can only copy videos from the computer to two monitors, and can not directly transfer the monitor screen to the other two monitors，nor to the "expand" mode that extends one monitor to another. 1 VGA IN, 2 VGA OUT: 2 Monitor screens are provided by one computer at the same time, supporting ultra-high 250 Mhz video bandwidth. Also supports stack cascade to increase the number of VGA output. EXCELLENT VIDEO QUALITY: 1920x1440 @ 60Hz, DDC, DDC2, DDC2B compatible, with automatic identification and detection technology, can automatically adjust the resolution to adapt to the monitor to maintain the best video effects. HIGH PERFORMANCE AND STABILITY: Using the original chip imported from the United States; High standard 1080p VGA cable with magnetic ring, which are to ensure the stability of the item run. Put an end to blur, ghosting, black screen and all other issues, just enjoy high-definition video life! WIDE COMPATIBILITY: Compatible with a variety of devices with VGA interface, such as computer / TV box / PS3 / PS4 / DVD player.It also supports Hot-Plug that you can plug and unplug the device without power off. PRACTICALITY: Up to 213 feet (65 meters) of signal transmission distance, excellent signal enhancement technology to make it suitable for TV stores; multimedia education system; stock exchange; airport railway station and other large information display platform. If you have any questions about this product by Sea Wit, contact us by completing and submitting the form below. If you are looking for a specif part number, please include it with your message.